Gökçe posted videos to Twitter and Instagram late Monday Eastern time of himself carving what appeared to be nearly ten lamb chops and other expensive meats and serving them to Maduro and wife Cilia Flores at his Nusr-et restaurant in Istanbul, Turkey. 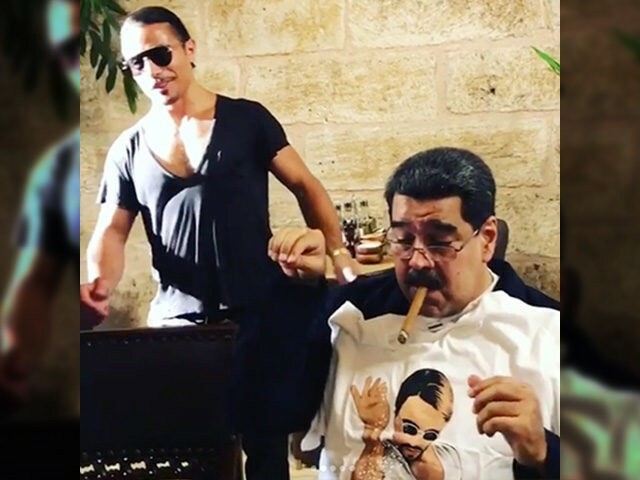 Other videos showed the chef and the dictator embracing, Maduro enjoying a personalized cigar box, and Gökçe gifting Maduro a shirt imprinted with the popular internet image of Gökçe pouring salt on food. In addition to hosting Maduro, Gökçe has long been a target of scorn from the Cuban refugee community for celebrating dictator Fidel Castro following his 2016 death – which triggered widespread celebrations in Miami – and hosting leftist soccer celebrity Diego Armando Maradona. Chanting “boycott,” “get out,” and “shut it down,” waving Venezuelan flags, and honking in solidarity, a large crowd of Venezuelan refugees, Cuban refugees, and supporters gathered in front of Gökçe’s Brickell restaurant Wednesday to urge residents of Miami and tourists not to give their money to a chef known to stand in solidarity with communist and socialist causes. A representative of the conservative Venezuelan political party Vente Venezuela told reporters that the objective is to have at least one of two people protesting with signs describing the torment the country suffers under socialism in front of the restaurant at all times until Gökçe apologizes or shuts the restaurant down. Los latinos en Miami le envian este mensaje a @nusr_et Haz repost..! @nusr_et #saltbae Out of business. The group Venezuelans Persecuted Politically Abroad (VEPPEX) organized the protest. As it remains ongoing at press time, there are no numbers available for the total participants at the event, though videos appear to show a crowd large enough to surround the corner high-rise that houses the restaurant.